Victor Lara likes his pickup - and he doesn't want to move out of his home in Rita Ranch to keep it. 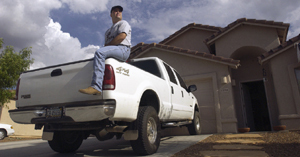 So he and other members of a homeowners association in Rita Ranch are working to change a restriction that keeps them from parking bigger pickups and other trucks at their homes. The beefed-up rear axle on Victor Lara's pickup makes his truck illegal to park at his Southeast Side home, according to deed restrictions. firm that manages the homeowners association's business. The restriction - included in the codes, covenants and restrictions, or "CC and Rs," of the homeowners' deeds - is common, said Iniguéz, whose firm represents dozens of other homeowners associations around Tucson. "All my homeowner association CC and Rs have some kind of restriction on the type of vehicles that can be parked in a neighborhood," she said. The axle-capacity limit affects Lara's pickup, a 2001 Ford F-350. It looks just like a standard American full-size pickup - except it's not as long, because it has a 6-foot "short bed," rather than the standard 8-foot bed. allowed in the 345-home neighborhood represented by The West at Rita Ranch Association. So the association's board cited Lara and at least 10 other residents in the past couple of months for violating the restriction. Becky Peradotto, Lara's neighbor, also doesn't like the "awful" rule that keeps her and her husband from parking their 20-foot-long pickup with camper that they use to pull a boat they own. "We're all up in arms, because it's starting to affect people with big vans - anything that you drive that's over 18 feet long," Peradotto said. "If we're not blocking the sidewalk where people have to go all the way around, I just don't see the reason for this," she said. Lara, Peradotto and others now are working to change the rule in an election to be held during the October meeting. He thinks most residents will vote to change the rule because they'll realize it's outdated, created at a time before it became common for Americans to buy larger pickups, SUVs, RVs, and other larger vehicles. On that point, Iniguéz agrees. The restriction "was made prior to the time when large vehicles were common to the neighborhood,"she said. Lara said he was so frustrated by the restriction that he decided to move out of the home he's lived in for two years. Then he decided he didn't like that or the other alternatives: sell the truck or store it elsewhere. He bought the truck a year and a half ago to pull his horse trailer, which he keeps at a friend's house in Sahuarita, along with the horse. He also uses it to get to and from work at Tucson International Airport, where the 10-year Air Force veteran works a full-time job with the Air National Guard's 162nd Fighter Wing. "So I'd rather just pay the $25 fine every month," he said. Then he and other members of the neighborhood association decided to change the restriction, which Iniguéz said has been in effect since the first house was sold in the development in April 1994. Peradotto said residents failed to change the rule in an election during the June meeting because they were confused about the language of the proposed changes. "We're going to work our darndest to get this thing overturned," she said. Iniguéz says she supports their efforts. But she said it's still possible that most association members may like the restriction, and vote to keep it.